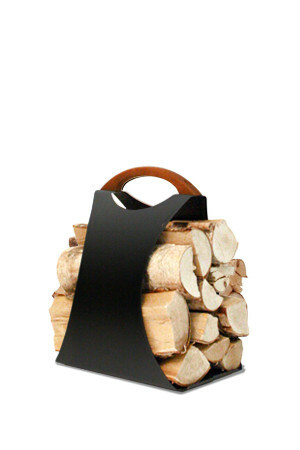 The HALI log carrier excites with its looks and undisputable functionality. It offers new design, reliability and practicality for day-to-day chores. The HALI log carrier excites with its looks and undisputable functionality. It offers new design, reliability and practicality for day-to-day chores. The light and ergonomically designed HALI log carrier is a good fit for both large and small hands. The product is made out of marine aluminum and it withstands heavy use. HALI is designed to be easy on your back and hands. With its smooth surfaces, HALI is as easy to carry as your grocery bag. The wooden handle ensures a firm grip and HALI rests comfortably against your leg. The carrying position is comfortable and ergonomic. When lifted, the carrier squeezes firmly against the wood. Consequently, both long and short logs are held in place securely. The HALI log carrier made of marine aluminum is a light and durable product. The high quality of the material guarantees that HALI resists the sings of corrosion even after several years and dents, regardless of whether it sits by the fireplace, in the sauna, outside, or in the woodshed. 1. The carrier is available in glossy white (Pure White) and metallicblack (Rock Black). 2. The groove on the bottom holds the wood in place. 3. Rubber padding protects floors against scratch marks. 4. The handle made of stained birch enables a firm grip. 5. The marine aluminum makes the carrier light and durable.